Imagine a deodorant tube that you don’t need to break a sweat to recycle. The increased impact of climate change in our day-to-day lives is a huge issue that is taking the world’s media by storm. The debate on the uses of plastic is also rampant. Plastic is now woven into the fabric of our existence, permeating all areas of society. Did you know that our cars and ‘planes are made up of around 50% plastic? Or that the majority of our clothing is made of polyester and nylon (both plastics)? Consumers are striving to reduce their environmental impact, a key component of which is recycling everyday household items efficiently and conveniently. However, certain household items can be extremely difficult to recycle such as deodorants and lip balm tubes. Why? The tubes are comprised of a combination of more than 50 different types of plastic! This makes it a minefield for consumers to determine what kind of plastic their tubes are made from, and whether their local recycler will accept the material. Most deodorant tubes are made from high-density polyethylene, low-density polyethylene, or polypropylene, but materials may vary by brand. To make things even more complicated, many brands have a twisting mechanism on the bottom of the tube that is made from a different plastic polymer than the rest of the container. As a result of this lack of clarity, once the product is finished with the plastic tube is either sent to unreliable recycling streams or worse still, to landfill where it can sit for between 500 to 1000 years or in the sea with over 12 million tonnes of other plastics. Environmental responsibility and the ethics behind our packaging is critical. Modern consumers are increasingly aware of their carbon footprint and want to know that they are buying a product that is environmentally friendly but also suitable for their needs. 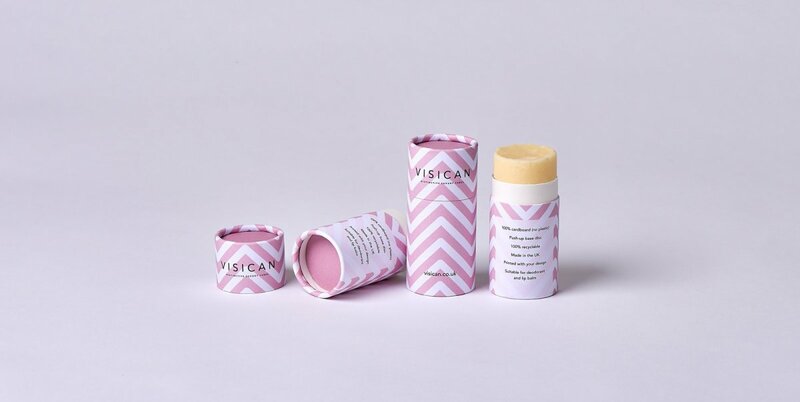 This has led us to develop a new push-up tube specifically for dispensing greasy items such as balms and deodorants. The good news is that it’s made from 100% paper and cardboard. Our products are fully recyclable from any home cardboard recycling collection point and are fully biodegradable under the correct conditions. An internal barrier stops grease permeating into the cardboard and allows the product inside to be dispensed with ease. Get in touch to find out about how our innovative packaging solutions can help your brand.